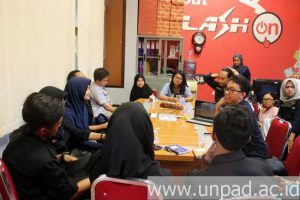 Universitas Padjadjaran’s Radio Unit, Radio Unpad, was visited by the crews of Jurnalpos Media of State Islamic University (SIU) Sunan Gunung Djati in the radio room of Rectorate Building Jatinangor, on Tuesday (28/11). The visitation was officially accepted by the staffs of Unpad’s Public Communication Office, Safa Annisaa and the entire Radio Unpad’s crew. The atmosphere of the SIU Sunan Gunung Djati visitation in the radio room of Rectorate Building Jatinangor, on Tuesday (28/11). The visitation was done in order to perceive the activity of radio management. As one of the press unit that is managed by the students of SIU’s journalism program, they are wishing to start an online-based radio broadcast or streaming radio, in their campus. “We are excited to visit Radio Unpad and we do expect another visit from Radio Unpad to Jurnalpos Media to strengthen our collaboration,” mentioned Agung Tri Laksono, one of The Jurnalpos Media members in the press release received by Humas Unpad. In the visitation, the crews from both sides were sharing their respective experiences. The Jurnalpos also had a chance to witness the RU’s broadcasting studio while being introduced to the studio equipment.